I had my first child at 27 years old. It was the most traumatic event of my life due to scary complications and a 3rd degree tear/episiotomy. 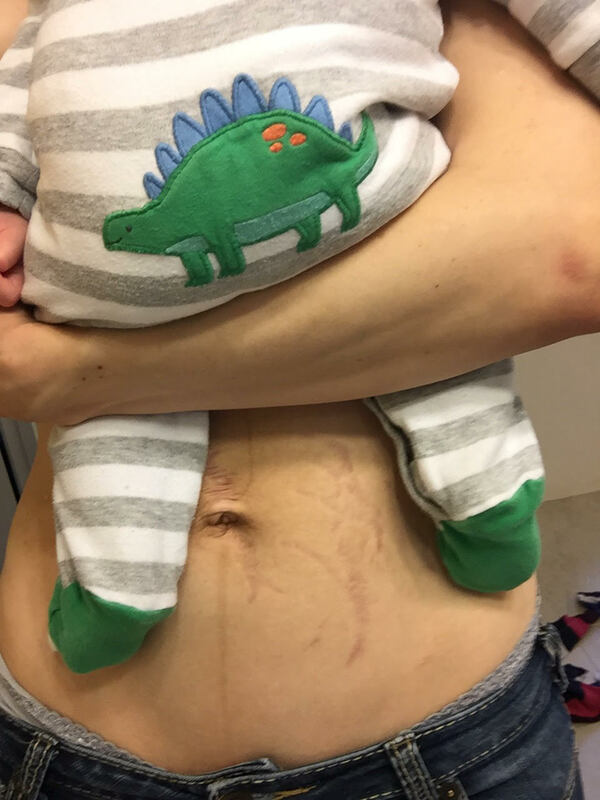 I suffered post partum depression and thought I’d never feel human again. After 2 years I was finally ready to try to conceive again and ended up having a missed miscarriage at 8 weeks that required a D&C. Again, complications, trauma, depression followed. After having my second child I developed a 10cm dermoid cyst on my ovary that needed to be surgically removed. So at 5 months post partum I underwent another surgery. I also suffered severe post partum anxiety this time and ended up in the hospital due to a panic attack that was thought to be a heart attack. At 8 months post partum I learned I was pregnant again and was dreading the back to back pregnancies. Now, here I am 8 weeks after having baby #3 (our last!!!!) and all I’m hoping for is no more surgeries, no more babies, no more depression and anxiety. The toll that babies take is not only on our bodies- but our minds too. Thank you so much for sharing! Your tummy looks great! I still look Like I’m 6 months pregnant.